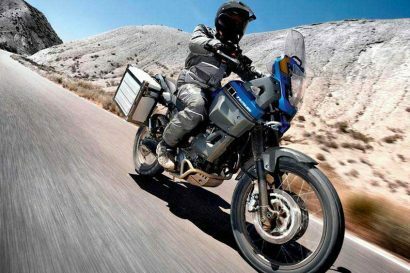 Last fall, with a summer’s worth of motorcycling still coursing through our veins, a discussion was started about the virtues of inexpensive adventure bikes. There’s no doubt a BMW R1200GSA water-pumper is a great bike, but it’s also pushing $25,000 by the time you bedazzle it with all the prerequisite farkles. 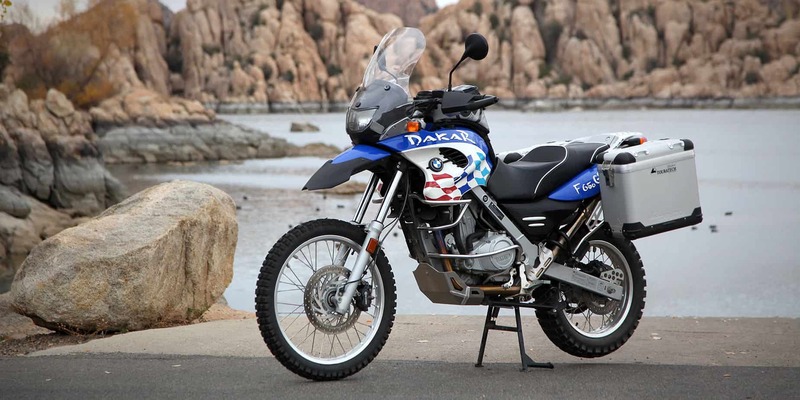 The “B” in BMW does not stand for “budget” unless you’re looking at second-hand models like the highly regarded F650GS Dakar. Early models can be had for a song, and like many mass produced motorcycles, can be found in exceptionally good nick. 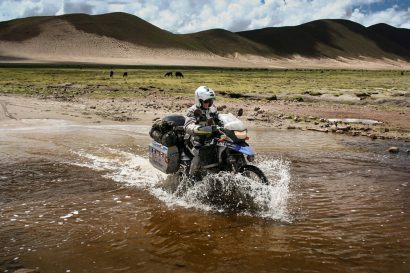 We acquired such a prize and with our friends at Touratech, set out to make it as adventure ready as possible. With the last accessory bolted in place, I dare say it’s just about perfect. Right out of the gate, there were a couple things we needed to remedy. A taller windscreen made highway miles pleasant but the footpegs were begging to be relocated. The easy solution was fitting the bike with Touratech’s popular kit designed to move the pegs back a full 2 inches. We paired that kit with their Long Distance Pegs for a better stance on the bike. Continuing the refinements to the ergonomics, we sent off the OEM seat to the gurus at Sargent Cycle to have it rebuilt with their amazing Performance Plus conversion. The new seat not only features improved foam carved to a perfect shape, it is covered in fabrics designed just for adventure riding. 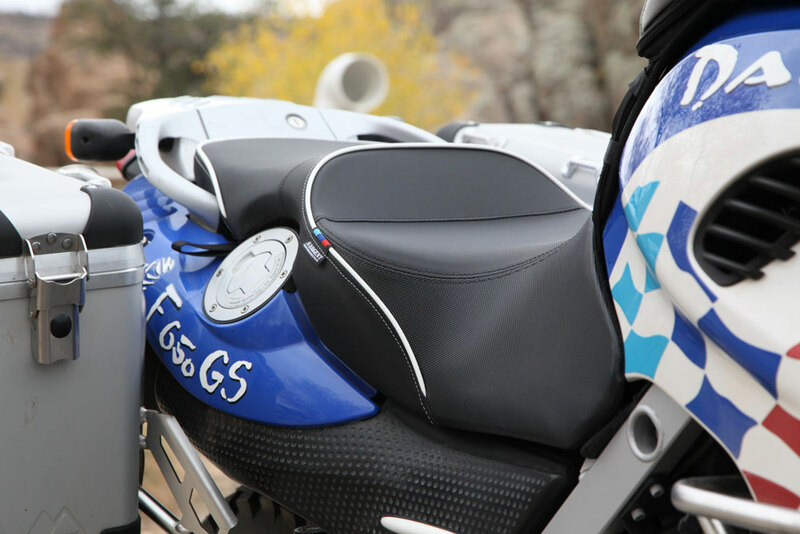 The new seat transformed the bike into a long-haul machine, and greatly improved the overall aesthetics of the bike. 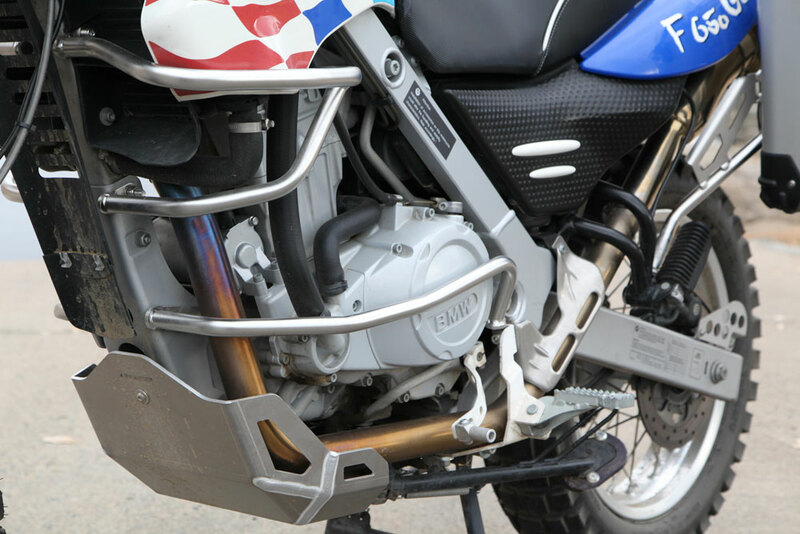 Any adventure bike worth its salt needs protection, so a full compliment of skid plates, engine, and tank guards were fitted. The factory skid plate didn’t seem hideous until we replaced it with the Touratech skid plate. Not only does it look better, it’s clearly a more substantial guard. The crash bars are elegantly simple, and don’t hang off the bike like a busted birdcage. All of the vitals now seem appropriately shielded from mishap. Additional praise for the crash bars can be attributed to the fact they don’t impede access to essential components for regular maintenance. 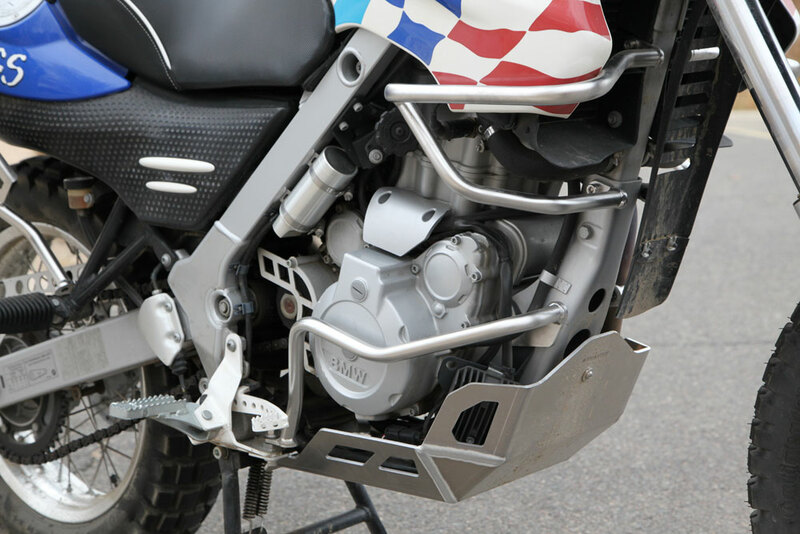 The “gas tank” panels can even be removed without pulling the upper crash bars off. By now, the Dakar was starting to gain some weight, although not much. 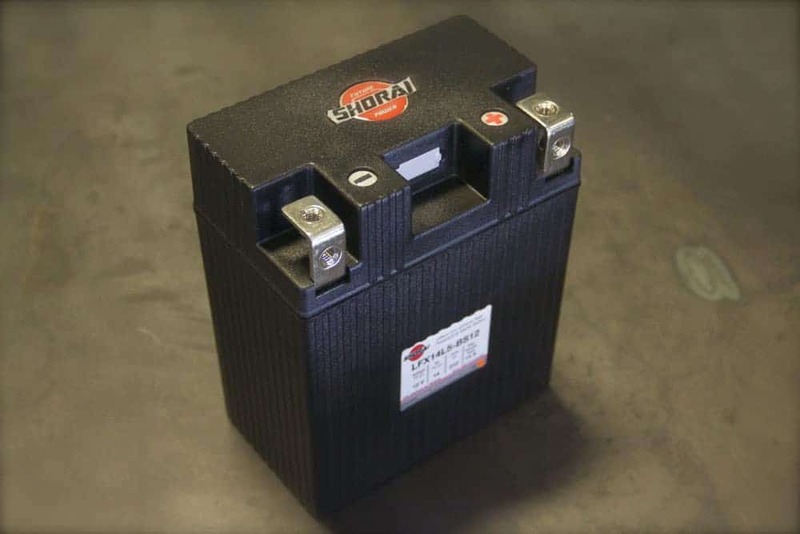 It was time to turn the scales back in a favorable direction and a quick way to shed four pounds was to replace the lead-acid battery with a Shorai Lithium battery. It also served to bolster the start-up performance, and while this bike seldom sits for long, it also reduced the need to always keep the bike on a battery tender. It is worth noting that start-up performance hasn’t been so great when the temps drop below freezing. The last major addition to the Dakar was a set of Touratech Zega Pro anodized panniers. Not only are they a handsome addition, they’re incredibly well built and easy to use. 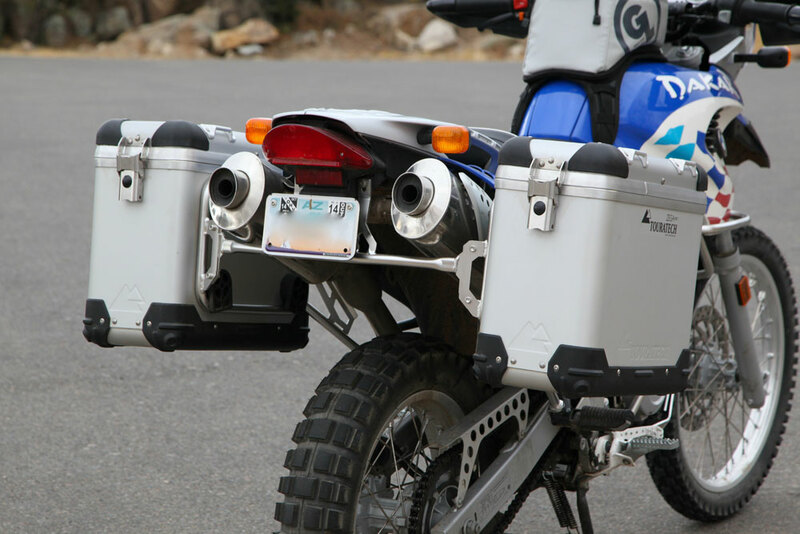 Because the F650GS is a relatively small and nimble adventure bike, we opted to go with the smallest size panniers. At 31 liters, they’re slim and light, yet big enough for protracted adventure travel. Easy to remove without a need for tools, they’re a nice addition to a bike which will see a constant mix of true adventure riding paired to daily commuting duty. The last thing to fall into place was a set of proper adventure tires, and we chose to go with the wildly popular Continental TKC 80, front and rear. There’s really not much left to do to this bike. The last item to install is a Garmin Zumo 660LM with a locking Touratech mount. With that, it’s ready for adventure. Even with all of these modifications and additions, the total bill is a fraction of what it would be for an equally built, brand new “bike bike.” In this configuration I wouldn’t hesitate to load it up and circle the globe. It would be easy to tally up the entire collection of accessories and improvements and determine this “budget bike” has jumped the shark and no longer represents a value. Many of the add-ons we selected were not entirely necessary, but the end goal was to build a price-minded bike we could roll out the door tomorrow for a lap around the globe or a jaunt to Ushuaia. In some ways, this bike was lightly modeled after the Dakar Allan Karl used on his three year trip around the world. In this form, there’s nothing left to want. 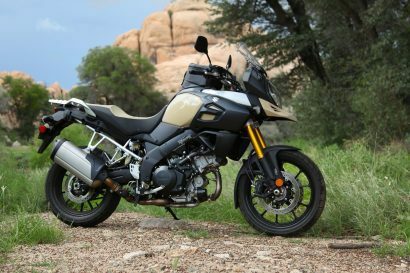 The bike was purchased with less than 5,000 miles on the odometer for $5000 less than a new, bone stock BMW F800GS. As the primary rider of this bike, I have to say I think it achieved everything we were after. I have logged over 3,000 miles on it since September covering Interstate, two-track and just last weekend, a nice 100 mile session of Arizona dirt road. It easily gets over 60 mpg, if not over 70. It’s been fun to ride, reliable, and true to the mission, would be a good pony for any long trans-continental ride.